As you can tell by the date of this post I have not written anything new here on Endevourly for what it seems to be a very long time. I am truly so devastated about this because my main goal is to positively grow this blog and to post useful, fun, interesting and innovative ideas to share with the public. Now that the school year began (my second year of college) I've been so busy everyday and so overwhelmed with work that I simply do not have time to dedicate to my blog. I wish to post at least 3 times a week but it has proven to be impossible. I am hoping that once I set up a good schedule (both with school, work + the blog) I can finally have everything functioning efficiently and actually running. Literally I've been attending school Monday through Friday, working hard and managing all the different tasks I have to handle daily. No excuse to leave my poor Endevourly behind though. I MUST get it running smoothly again. To begin, I am so excited to share with you some of my newly found obsessions and what I've been loving these days. Let me warn you, the list is quite unusual, random and unexpectedly... well... random but seriously incredible in my opinion. This is installment #1 of a new series here at Endevourly called "Classic Chic Must Haves"
Say what? 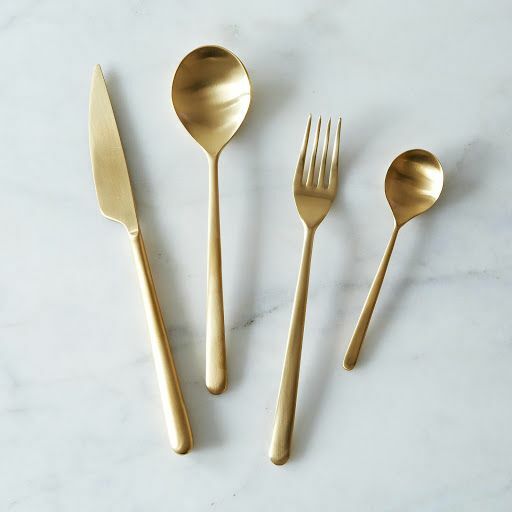 Yep, for some reason these beautiful gold plated eating utensils call my attention and have made me fall in love with gold once again. I simply love gold anything but these would just elevate the classiness of any table setting. They look so elegant, people. Love, love, love. *Girl swoons* You can find sets online, thrift or antique stores. Ok, ok. This is where things get random. You were probably expecting some sort of materialistic obsession, right? Well, this particular "career" or "job" is truly magnificent when considering the amount of knowledge and pride one gets by cleaning, and thoroughly managing a home. (About myself, I've learned that I actually enjoy doing this). Yes, indeed. A professional housekeeper is completely in charge of the home. From the cleaning, to the laundry, grocery shopping, keeping inventory, stocking and meticulously caring for every detail in a household so that it runs smoothly and it always looks "guest ready". (You may be doing this at your own home already, I know I am, but if you can get paid big money for such an interesting job or hire someone to do it, even better). (On a later post I will discuss with you "Housekeeping Essentials" + a great giveaway as an extension to this). Scene from "Gran Hotel" (Found On Netflix). Professionally managing a house (just like in the English Manor Houses back in the day as those houses were lavish mansions that were the definition of true elegance). I love being in control of all that has to do with my household and leading an organized and professional approach to this elevates the standard and quality of your home, in my opinion. Consider those beautiful (always clean) looking homes you see on TV. You can bet your precious metals a lot of the homeowners hire housekeepers to complete the task. (Many may like to tackle household chores on their own... like myself, though). Properly set a table (this is so great specially if you enjoy hosting dinner parties). Even if you don't often do this, if you get accustomed to properly setting the table, know that this just makes the whole dining experience even more special and pleasant. Life is short and one should always attempt to elevate even the smallest moments to truly beautiful ones. Don't stash your delicate glassware for special occasions, use them on a regularly basis because you too deserve some classiness everyday. Thoroughly deep clean and organize a home efficiently (so that it always looks beautiful). I envy homes that look as if no one lives in them because everything is always clean, tidied away and a well thought out organizational system is put in place. One thing I truly admire is a home that's always ready for guests and unexpected visitors (you know you've had those and your house has been a complete mess... *wink, wink* am I right?). Care for different materials such as wood, fabric, glass, metals (silver) and even precious artwork. (Important because properly caring for them ensures a longer life for your things). I have to confess that my bed is one of the most uncomfortable spots in my room. Say what? It is because it doesn't feel comforting, soft, plump or like one that you would find in a 5 star hotel. This made me spend hours searching for ways to make my bed super inviting, comfortable and incredibly soft. I discovered there are a few things needed to accomplish a beautiful and comforting bed. Why am I loving this right now? Well, simple. You spend a lot of time on your bed every single day so it MUST be a place you want to feel good in, of course. (I will soon discuss with you the Essentials for a Beautiful, Cloud Soft Made Bed). These are just some of the benefits of learning to "professionally manage your home" . I know I see household chores and tasks as a job of its own because it can take up so much time of your day/week, so why not. Having this said, doing things correctly and efficiently (hence using the word professionally) just makes the whole thing feel a bit less like a chore and more like a necessity just like a real job would be. How are you getting paid? By seeing your home breathe and feel serenity, peace and complete fabulousness at all times. For now those are the things I am loving these days. Told you the list would be very random, but don't these things make you want to reinvent yourself in a positive and different way? Tell ME what you're loving right now..?